You finally get the big boat you want and find a great mooring. 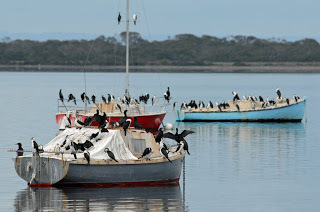 However, the birds enjoy your boat as much as you do. I found a great little option that works well to keep away feathered crew from sitting on the rails. It takes about 10 minutes to do every time but it does save the hours of scrubbing off bird poop that has the consistency of cement. Go to your local hardware store and buy large zip ties and a spool of nylon line or monofiliment. Put the zip ties on your bow and stern rail with the tails up. I spread them out about 6 inches apart. Birds usually like to sit at the bow and stern the most. Next, zig zag your line from the bow back to the stern about a foot or two apart. If you are having birds on the spreaders hoist up a small section of plastic construction fence. If you do not mind looking like the Clampets, it works. Other options are to use more nylon line and hoist the line but have the bottom tied around 2 feet from the base of the mast so the angle deters landing. When it is time to sail, just coil the line like normal and save it for next time. Zip ties are cheap, leave them on or cut them everytime. For those who have experienced the winged horror this does work well.